This entry was posted in Favorite Perfumes, My Stats and tagged Ambre Sultan, Amouage, Carnal Flower, Chanel, Climat, Coromandel, Cuir de Lancome, DSH, Frederic Malle, Guerlain, Jo Malone, Lancome, Lyric, Serge Lutens, Shalimar, Sweet Milk, Vert pour Madame. Bookmark the permalink. Excellent! You are simply awesome, Undina! I love that post and the image is hilarious!!! Thank you, Birgit! Your Monday Questions are always so much fun! I’m not surprised to see Guerlain on top. Interesting breakdown of the results. Thanks. Very interesting analysis and hysterical cartoon! Thank you, I’m not an artist so it was a challenge. Absolutely fascinating! And I agree: the image of the island is awesome! It’s really hard when you have an image in your head but can’t implement it properly. I tried really hard and, in general, am happy with the result. So thank you. Oh my gosh! Wonderful work! Makes me wish I had answered the survey! 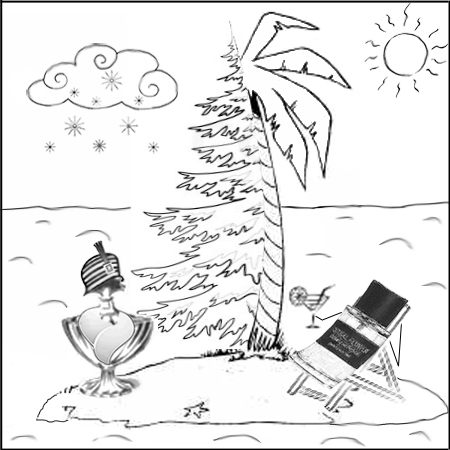 What are your 10 deserted island perfumes? So funny… since Mals brought the topic up on her blog yesterday, I actually typed my choices up over there, and then my comment got eaten. So I’ll try one more time. But I’m not sure I’ll perfectly replicate what I typed over there. 11 is fine (since Mals allowed 12 ;) ). I should probably get to try Lanvin Arpege: I keep reading about it but somehow I never came across it. Oh, now this is a fun poll! I went back and checked, and five out of my ten were unrepeated: Black Cashmere, Pulp, 28 La Pausa (which surprised me), Ambre Fétiche and Cuir Ottoman. You and I both had Heure Exquise on our lists, and I shared Après l’Ondée with Carol. And Coromandel got lots of love, yay! Woman, you are a force of nature! This was the most entertaining of your “Entertaining Statistics” … I absolutely loved it, and you drew that cartoon??! I noticed both Heure Exquise and Antonia on your list. And I will definitely come to your part of the island at least for Opus I, No.22 and Chypre Palatin. I am obviously a freak for not being that into Carnal Flower. Carnal Flower isn’t for me either. Amouage, on the other hand, is a brand that alone might be enough for me for a while. This was definitely fascinating! I’m surprised about Carnal Flower too, and also by how popular Mona di Orio is for a small line – that says a lot about quality, doesn’t it? Thanks for compiling the stats! Thank you for highlighting that fact about Mona di Orio – I didn’t realize that it was the most popular brand after all big players. It’s fascinating how many different angles there are to any set of numbers. I also woner if you combine other perfumes what would be the ratio of “others” to the charted perfumes? I’m not sure what it tells us (it definitely can be used for something, I just cannot figure out now for what: my statistics course wasn’t too deep) but it’s easy to get. 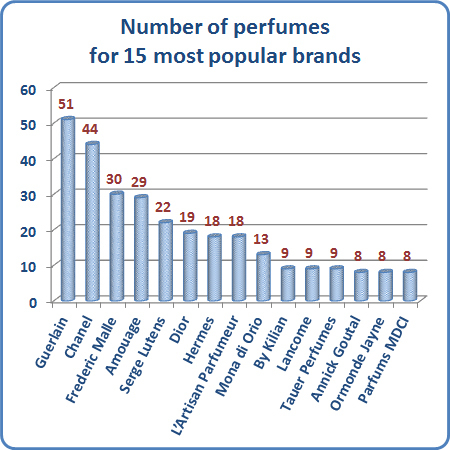 Most popular brands got 295 perfumes mentioned (with duplicates), “others” have 158 perfumes mentioned (again, with duplicates). It’ll give an idea of the market’s “megavendors” to those who have limited time – should I look for one of a kind or a “megavendor”?